I found this recipe for Phyllis’s baked fish my mother’s wooden recipe box and decided to give it a try. It comes from my mother’s dear friend, Phyllis, who was a superb cook, and who gave us her mango chutney recipe. By coincidence, we will be meeting up with Phyllis’s son and wife next week during our vacation to Pennsylvania and New York. I haven’t seen Mary Alice in years and years, but we have been chatting on the phone recently and she asked for copies of any recipes I had from Phyllis. Both Phyllis and my sweet mother are gone now, but their recipes continue to give me such happiness and are a link to pleasant memories. Mary Alice was happy to have, at last, her mother-in-law’s mango chutney that has been in my family for about forty years! The original recipe for this baked fish called for haddock, an Atlantic Ocean fish that is a wonderful all-purpose white fish. I tried it with some Alaskan halibut, my husband’s favorite. I can never resist playing with a recipe, so I substituted shallot for the onion, added some Meyer lemon juice and zest, and totally eliminated the salt. TIP: Be sure to zest the lemon before you juice it. 2. In a medium-sized skillet, melt the butter and cook the shallots until they are limp, five minutes. Add the flour and cook, stirring, for 2 minutes. 3. Add the stock and wine. Cook, stirring, until mixture thickens. 4. Add the parsley, lemon juice, lemon zest and pepper. Stir and remove from heat. 5. 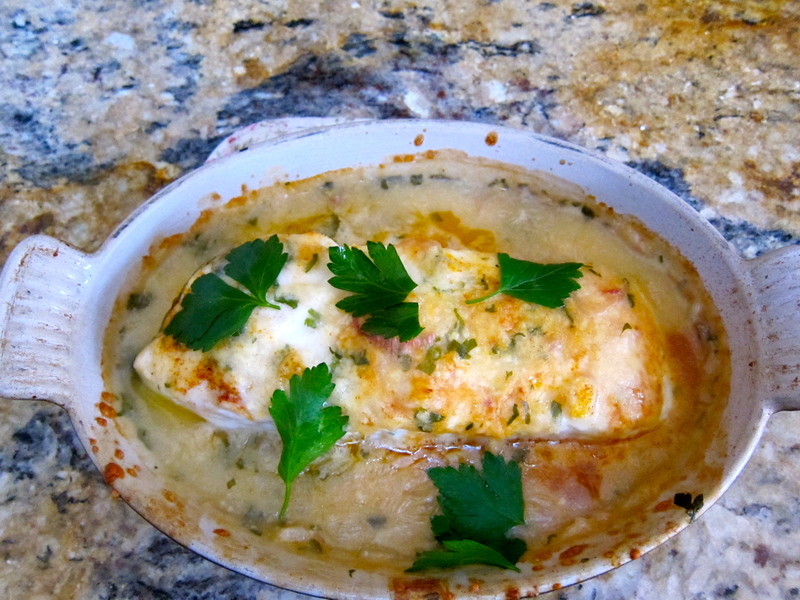 Place the halibut in a shallow, buttered baking dish. Cover with sauce. Top with Parmesan and a dusting of paprika. 6. Bake for 20-25 minutes, until you can flake the fish with a fork. Such a good recipe. Fish never has to be complicated. Love it. Thanks, Elizabeth, we ate an entire pound of halibut between us Sunday evening! This sounds like a yummy easy weeknight dinner. I’m craving it now.